Weirdest Bicycle Ever, The Hyperbike | OhGizmo! The conventional bicycle is unstable and dangerous on the road. The rider is vulnerable in traffic no matter how experienced. It is the height of danger to be balanced on two inch-wide tires with nothing between the driver and road objects. The operator of a Hyperbike uses a total-body climbing, swim-like motion to propel the Hyperbike, while balancing as if on a unicycle. The driver twists his torso, contracts the stomach and back muscles, and alternately extends the arms up and down as in a foot pedal motion, while coordinating with the legs to get the best push and pull from the lower pedals. Yeah, we’ll take our chances with the good ole unstable two-wheeled bike, thank you very much. No word on price or availability, at least from our cursory review of their atrocious looking site. Any hint on where you’re supposed to park it? Holy COW. Looks like a monster!!! 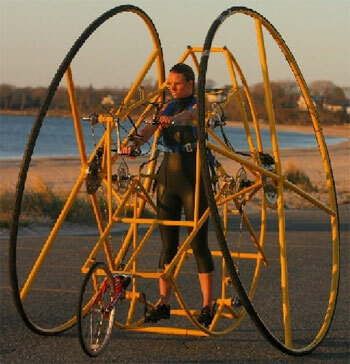 Weirdest Bicycle Ever, The Hyperbike? No, that would be a Tri-cycle! This thing is just so stupid. The inventor claims that speeds of 50 MPH are possible, but that?s pure rubbish. He?s apparently based that on the gear ratios alone, without accounting for the horrible aerodynamics, the moment of inertia of the needlessly gigantic wheels, or the tremendous weight of the contraption itself. I?m all for odd pursuits, but don?t try to tell me it?s some sort of design and engineering breakthrough when it?s really just a poorly considered pile of pipe.